← You could win a £250 holiday voucher in our first ever photo competition! Pembrokeshire is a popular holiday destination in West Wales and some of our hidden gems are so beautiful, they are completely priceless! These deep greeny-blue waters are surrounded by a semicircle of natural rock and stone walls constructed during the life of a former quarry, now flooded. It is a picturesque location, with ruins dotted everywhere, amazing views out to sea, and the enticing lagoon to jump into! 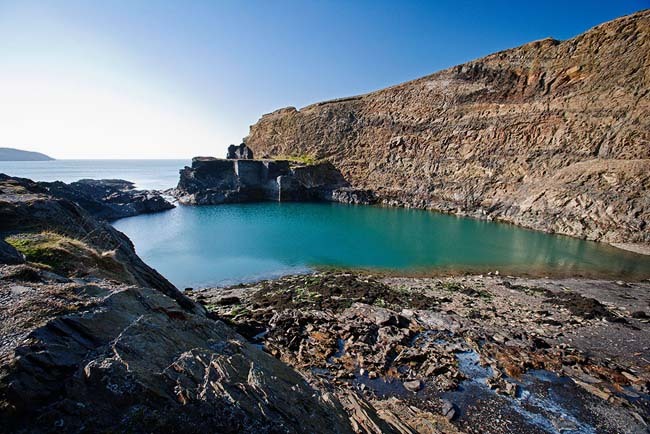 The man-made wonder of the Blue Lagoon sits within Trwyn Castell promontory, to the north of Abereiddy beach. Now approximately 25m deep, this small former slate quarry fell into disuse and flooded when the sea broke through the outer wall over a hundred years ago. There was once a steam-hauled lift when the slate was exported across the beach and later by tram to Porthgain. Ruined quarry-workers’ houses near the beach, called ‘The Street’, were abandoned in the early 20th century. There are surviving platforms built high into the natural rock walls from which coasteering groups love to jump. The lagoon has also hosted the Red Bull Cliff Diving World Series – part of a worldwide stage that includes Copenhagen and La Rochelle. You can also spend time exploring the interesting geology at the site and hunt for fossils. There is a busy car park which is uneven in places, alternatively, take the shuttle bus to the site, or find it on a lovely walk along the coast path. Full of foxgloves, bluebells and other woodland flowers, these beautiful woods invite you to explore their depths and get lost among the trees. Mossy green hillocks and rounded, moss-covered rocks cover the floor under the glades of the short twisted oaks, themselves lichen-covered. In fact, it is hard to find anything that is not moss or lichen-covered in these parts! Reminiscent of a fantasy, there are some delightful walks through this ancient woodland, where you almost expect to turn a corner to see hobbits and elves. The paths take you through glades and over streams, past outcrops of bedrock and evidence of old stone walls. The broad-leaved woodland has over 400 species of lichen, attesting to its healthy atmosphere, as well as ferns, with information boards across the site. Park near Canolfan Pentre Ifan education centre, set in a 600 year old former Tudor gatehouse, and walk through to Pentre Ifan Neolithic Burial Chamber. 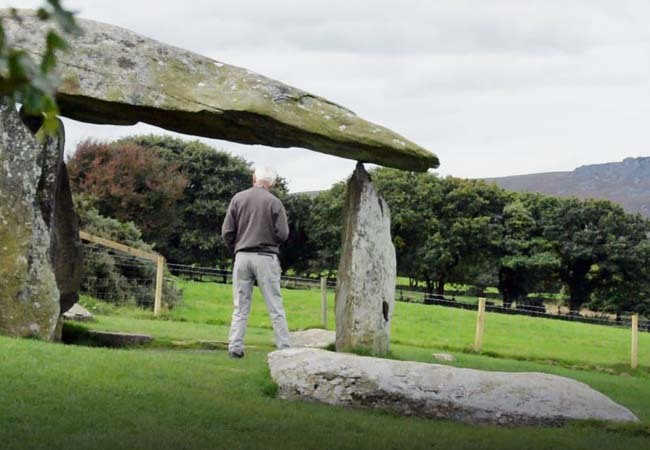 Alternatively, take a round walk from the monument, past a possible prehistoric fort and Ty Canol National Nature Reserve. This idyllic little horseshoe cove can be found on the north-west corner of the Angle peninsula. This award-winning beach is perfect for a family holiday, surrounded by quiet farmland and with rocks with their striking geological formations extending out into the sea on each side. The narrow stretch of beach at high tide turns into a wide expanse of beautiful sand at low tide, with plenty of room for beach cricket and kite flying. Swim, sail, canoe, surf or try a spot of sea fishing within these sheltered waters. The rocks are perfect for rock pools, and you can find your way through these rocks to the secret beach beyond – but don’t get cut off by the tide! Look out to the impressive Napoleonic fort on Thorn Island, used in later years as a hotel. The beach is also a designated SSSI due to a small green starfish, found here in 1979. This safe sandy beach has a free car park, toilets, telephone, and pushchair and disabled access. There are strong currents, so make sure to check the tide times. 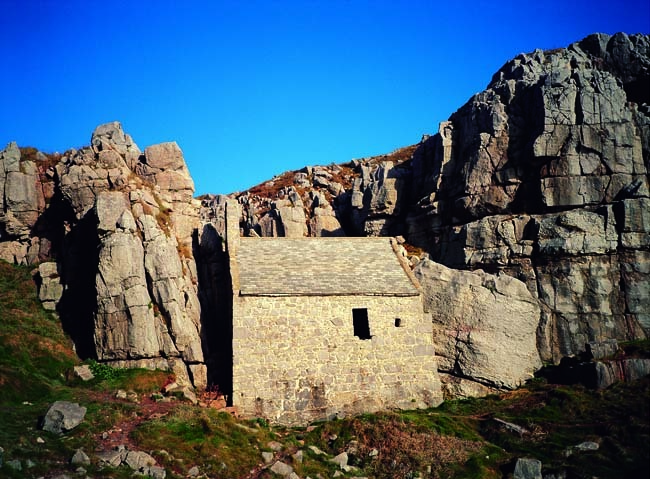 This tiny restored chapel has been built into a cliff and sits perched at the back of a steep, rock-strewn little cove, with views out to the beautiful blue sea. Steep steps lead down to the site and through the chapel, with its simple doorways and tiny slit windows, to the cove below. Found on the south coast of the Pembroke peninsula near Bosherston and Barafundle Bay, the 13th-century chapel was built on the site of the hermit’s cell of St Govan, a sixth-century hermit. It is said that St Govan was an Irish monk travelling to visit St David when he was attacked by pirates. After a rock fissure opened up, enabling him to hide, he is then thought to have stayed out of gratitude, living within the cave and warning locals of further attacks. The small cave within this fissure has since been built over by the vaulted chapel. Rumours link the saint to Gawain, one of King Arthur’s knights. Legends also tell of St Govan’s lost bell, perhaps entombed in one of the rocks at the shoreline. There is a simple small bell-tower on the chapel roof – but no bell! St Govan’s remains are thought to lie under the altar. Walk along the Pembrokeshire Coast Path and take the steps down to the little cove, or park at Broad Haven South or Bosherston village, and walk along the coast path or road. To find some of the best secluded beaches you need to walk off the beaten track. For an adventurous day out, take a walk and explore this isolated secret beach. The amazing geology here is striking, with vertical striations running up the cliffs and popping up in the sand across the beach. The rocks strewn around the edge of the bay are a distinctive red colour. Low tide is the best time to visit when the narrow beach widens to reveal a wide expanse of sand suitable for kite flying, epic sandcastles and The site is also great for surfing at low tide. 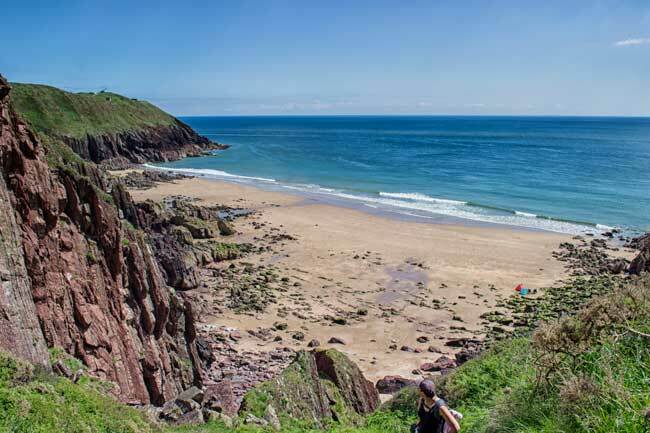 To find this secluded bay, park near Manorbier Youth Hostel, walk westwards along the coast path, past the MOD’s missile test firing facility at Manorbier Camp. Take the footpath across the fields and follow the steep, winding steps down to the rocks below. Alternatively, take a pretty walk around the cliffs from the car park at Manorbier village, with its historic/beautiful castle and Norman church. This natural wonder is a green pool of tidal water, surrounded by sheer cliffs with the sea on one side and farmland on the other, to the south of Ceibwr Bay. It was created by the sea hollowing through soft rock to form a sea cave, which then collapsed to leave an open bowl. Known as Pwll y Wrach, it is a tempting site for those who love to explore, while these waters are a great attraction for kayakers and canoeists. As you paddle along this stretch of coast, the narrow entrance is tricky to spot. The Cauldron is accessible at low tide through a narrow access channel, where there is a waterfall and a beach reached only by water. There is also a small water-filled cave into which you can squeeze yourself. Pwll y Wrach can be found on the Pembrokeshire Coast Path if you fancy a scenic walk, where you are likely to spot bottlenose dolphins. The path takes you past the Cauldron one on side of a knife edge and the ocean on the other, with coastal wildflowers surrounding the exposed natural geology. There is a bus from Cardigan to Fishguard from which you can walk the last mile, and roadside parking at Ceibwr. Alternatively, park at the nearby village of Moylgrove and walk for just over 1 km to the cliffs, where you can watch the choughs, or the seal pups in autumn, or winter waves crashing in. Nearby there are further caves, a natural spring, and the possible prehistoric enclosure of Castelltreruffydd. 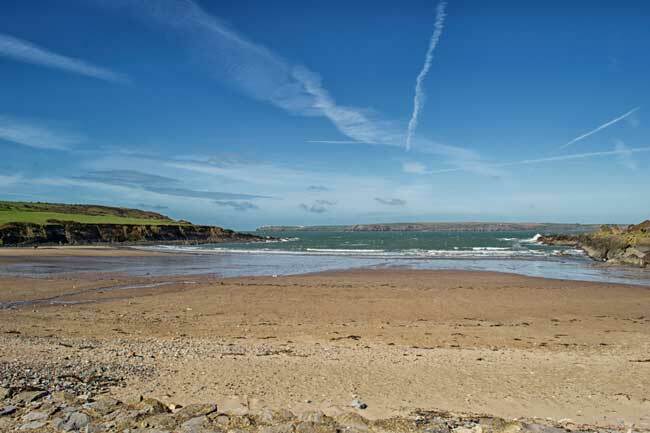 For a relaxing holiday in this part of Wales, choose from a range of Pembrokeshire cottages. 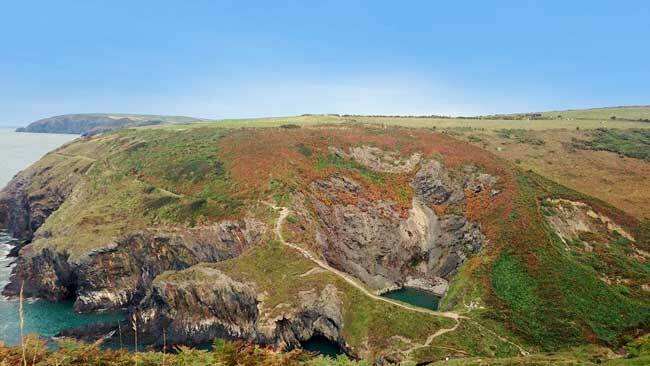 This entry was posted in Places to see and things to do, West Wales walks and tagged outdoor activity, pembrokeshire. Bookmark the permalink.